I plan to attach my 2014 and 2015 annual leave letters to prove I was on leave, and a letter from my sales manager who was in charge of the business during my vacation. I intend to explain all my sources of income in additional letter because the ECO calculations of my income were different from mine. How else can I improve my new application? (e) must have sufficient funds to cover all reasonable costs in relation to their visit without working or accessing public funds. This includes the cost of the return or onward journey, any costs relating to dependants, and the cost of planned activities such as private medical treatment. 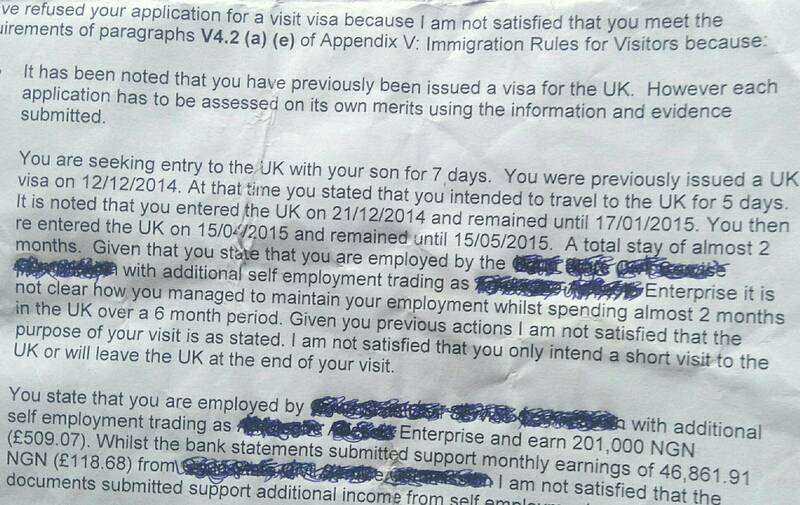 The ECO went through your financial evidence and determined that you did not have the capacity for a visit to the UK because you are apparently making less than GBP 150 per month (118+25 = 143). You believe that the ECO got the exchange rates wrong and that your income is really about GBP 365 per month. If you can substantiate this income and explain how the error occurred with neutral language, your position will be marginally improved. In a previous application you told them you would be staying for about a week and this was proportionate to your job situation and your financial capacity so they issued the visa. You then stayed for a long time, Presumably you were not accommodated for free and even with the most generous calculations a two month visit to the UK should consume close to a year's salary for you. Had you disclosed your agenda in your application they would have refused because your outlay is disproportionate to your means. Well,there was change in circumstances, my 2014 annual leave was granted 21december 2014 which lasted 30January 2015., cos my holiday was long i decided to enjoy it and left.on 17th January. You expect to tell the ECO that you applied for a 5 day trip and had no clue that you had holiday banked. Your holiday dropped from the blue with no prior notice on 21 Dec 2014. This is going to be a terribly awkward explanation and they will not buy it because people who are planning international travel will often know how much holiday they have banked. Naive strategy. The ECO will most likely conclude that you painted them a picture of a short visit in order to qualify and then exploited the opportunity. So returning to V 4.2 (a), it's likely the ECO concluded that you were actually looking for work in the UK during those 2 months and had you found work (illegal work by the way), you would not have returned to your home country. Given that the performance on your last visit was poor and your finances are marginal and that you will be representing yourself I would expect them to use the discrepancy method to generate another refusal. Accordingly you will need to considerably improve your evidence and to think up a compellingly sound reason for your performance shortfall. It needs to be more convincing than citing a "change in circumstances" and "...I decided to enjoy myself..." because how did you support yourself and where did the money come from? Any other suggestions will be appreciated. My suggestion is to build up a record of performance in the affluent Commonwealth and countries like the USA and Brazil before attempting to apply for a UK entry clearance again. Not the answer you're looking for? Browse other questions tagged visa-refusals proof-provenance-of-funds standard-visitor-visas or ask your own question. UK visa refused due to length of previous stay (paragraph 4.2) - what to do? If I stayed longer than stated on my UK visa application, would that affect my next application?